Process and plant engineers in search of a next-generation air/gas flow meter that is suitable for critical operations and hazardous environments will find that the future-ready ST100 Series Thermal Mass Air/Gas Flow Meter from Fluid Components International (FCI) is now rated for Safety Integrity Level (SIL) 1 compliant service. FCI’s SIL compliance rating for the ST100 Flow Meter has been documented in a failure analysis report with FMEDA techniques by Exida, an accredited global functional safety certification company. The ST100 Flow Meter has been classified as a Type B subsystem in accordance to IEC 61508-1 with a hardware failure tolerance of 0. The Probability of Failure on Demand (PFD) meets SIL-1 capability standards. SIL ratings provide a key assurance of confidence that safety rated equipment has been tested and shown to prevent dangerous failures and to control them in the event they occur. FCI’s new SIL-1 safety compliance assures its customers that the third-party testing organization (Exida) has tested the ST100 Flow Meter and when the product is in use, the process risk is reduced to the designated level. FCI’s customers can rely on the company to improve safety and reliability continually. Whether the need is for 4-20 mA analogue, frequency/pulse, alarm relays or digital bus communications such as HART, Fieldbus, Profibus or Modbus, the ST100 is the solution. Should a plant’s needs change over time or an upgrade be desirable, the ST100 Flow Meter adapts as necessary with a plug-in card replacement that can be changed out by plant technicians in the field. The ST100 Flow Meter’s unique graphical, multivariable, backlit LCD display/readout brings new meaning to the term “process information”. It provides the industry’s most comprehensive information with continuous display of all process measurements and alarm status, and the ability to interrogate for service diagnostics. The user-friendly ST100 stores up to five unique calibration groups to accommodate broad flow ranges, differing mixtures of the same gas and multiple gases, and obtains up to 1000:1 turndown. Also standard is an on-board data logger with an easily accessible, removable 2-GB micro-SD memory card capable of storing 21 million readings. The ST100 is the first thermal flow meter to offer three different types of flow sensors to best match user applications. The fast-response FPC-style is a fast response features an integral flow conditioner and protective shroud optimized for compressed air and clean gas applications. The fast-response, general purpose FP-style features a protective shroud and is the sensor used with FCI’s VeriCal™ in-situ calibration option. For wet or dirty gases, or erratic flows, the unshrouded S-style facilitates easy cleaning and provides a smoothed response. The comprehensive ST100 Series is comprised of two core model families: ST and STP. ST meters measure both mass flow and temperature, and the exclusive STP family adds a third parameter, pressure, making the ST100 the world’s first triple-variable thermal flow meter. Both families include single-point and dual-element models as configurations outfitted with FCI’s exclusive in-situ calibration option, VeriCal. Designed for rugged industrial processes and plants, ST100 Flow Meters include service up to 454ºC and are available with both integral and remote (up to 1000 feet [300 meters]) electronics versions. The ST100 is agency approved for hazardous environments, including the entire instrument, the transmitter and the rugged, NEMA 4X/IP67 rated enclosure. 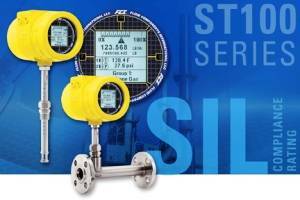 Instrument approvals in addition to SIL-1 include ATEX, IECEx, FM and FMc.